Sept. 15 was our first Quest ever, and it won’t be our last, so don’t be sad if you missed it! Just be sure to mark your calendar and share pictures with your students for next year. We have no doubt that word of mouth will do most of the publicity for next year’s event and will surely double this year’s attendance of 150. St. James Christian Life Center was the perfect host church for this event under the leadership of their Children’s Minister Sean Dunbar who made sure we had everything we needed to make the event run smoothly. Michelle Wilkins, Sadie Wohlfahrt, Peaches Smith, and Tiffany Jones helped with all the registration, set up and take down throughout the day. The lessons were written by Karen Swales who spent countless hours planning and writing appropriate third through sixth-grade lessons. We were blessed to have the Rev. Zach Roberts, the Rev. 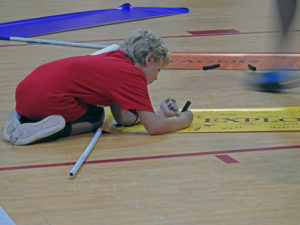 Jonathon Bevil, Pam Snider, and Melinda Shunk to teach each group of about 30 children. Sure we had bounce houses, an amazing playground, nine square, photo booths, and box lunches, but what touched children’s lives the most was bagging rice for the food pantry, worship with students serving Communion, and hands-on fun rotational lessons that taught kids that our God Loves Us, our God Chooses Us, our God Gives Spiritual Gifts, and God Calls each of us. 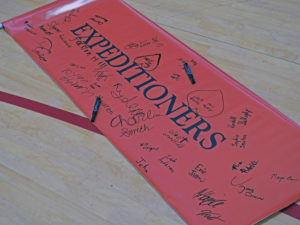 A flag at Quest signed by many of the kids who participated in the weekend’s events. 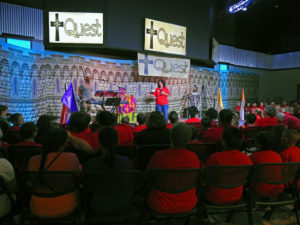 Melinda Shunk, Coordinator for Children’s Ministries, speaks to kids at Quest. Bishop Mueller was able to Skype into the morning worship to share with the students his call for the larger church, and the Rev. Jim Polk led the student-assisted Communion. Craig Williams used his gift of music to get everyone rocking and out of their seats for praise while calming us back down as we learned that we can even offer prayer in song! We also worked hard on the Quest Connector’s Challenge! 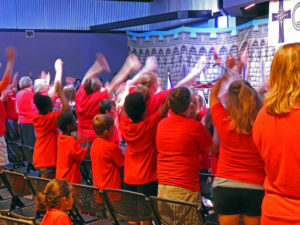 Students were challenged during the opening to connect with and remember the names of at least five or more people outside of their home church. 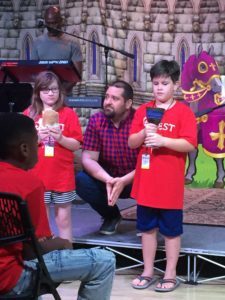 Twelve students were awarded a Cross Quest necklace and candy for standing up on stage at closing and naming at least seven new people that they met by the end of the day. 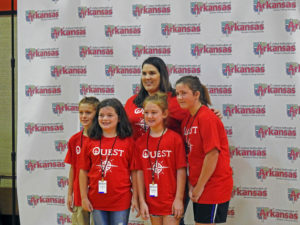 The goal of this event was to give the tween students something that was a statewide event tailored just for them. 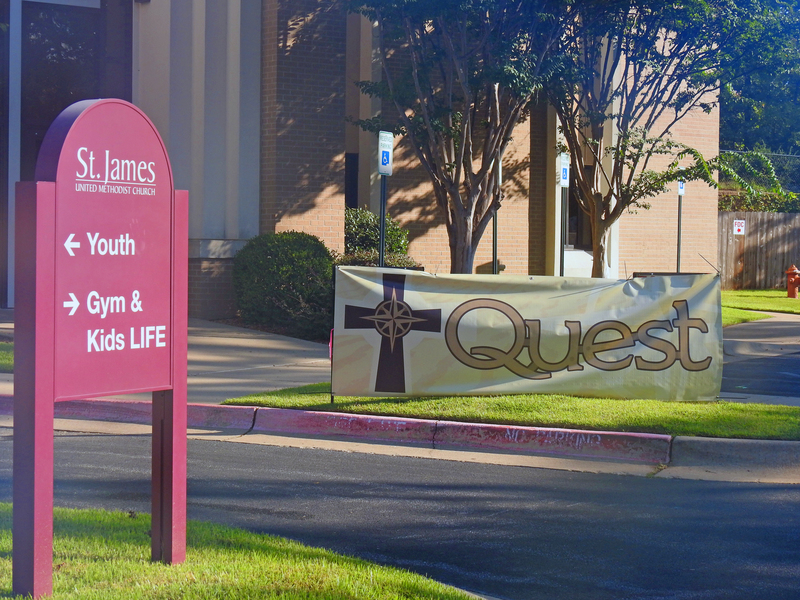 Quest was an Arkansas Conference event that brought them outside of the walls of their hometown church to show them we are called to be one church. God truly blessed our day at Quest!